As regular visitors to this blog will know, the independent research firm TechValidate has been busy comparing PrinterLogic’s stated benefits with customers’ real-world experiences. That effort has left us with plenty to feel confident about. Because in survey after survey, TechValidate has found that PrinterLogic brought proven and consistent results to a wide variety of companies across an equally wide variety of industries. And a recent case study with a Fortune 500 energy and utilities company (TVID: 69D-BC1-93B ) has demonstrated more of the same. This Fortune 500 energy and utilities company chose to migrate to PrinterLogic as a single comprehensive solution that would address all these problems. In just one month, the company rolled out PrinterLogic across its entire organization. By the six-month mark, the return on investment (ROI) was so significant that PrinterLogic had already paid for the cost of its installation. Since that point the ROI of implementing PrinterLogic has exceeded 100%. Print-related calls to the service desk were reduced by an incredible 70%. The amount of remote server infrastructure also saw an amazing 70% reduction. The time the company was spending on print management dropped by 50%. Printer downtime across the organization was cut by half, providing a huge boost to productivity. PrinterLogic’s effortless printer driver management earned a "great," and its printing security got a rating of "excellent." 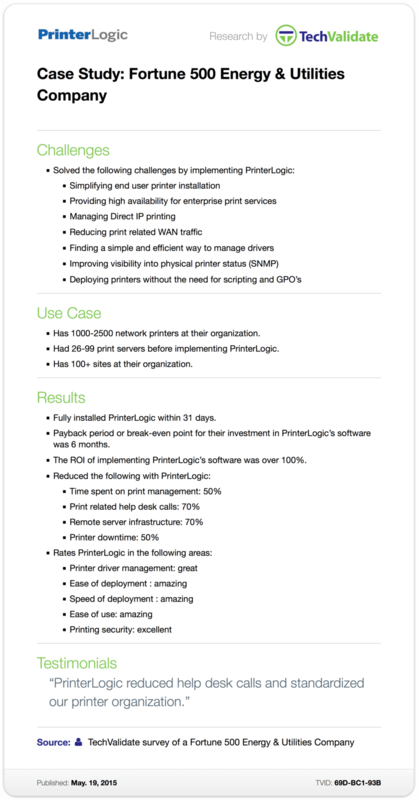 With results and recommendations like that, just imagine what PrinterLogic could do for your organization!